Dr. Lalit Mathur is Professor of Periodontics, Pacific Dental College & Hospital ,Rajasthan, India. Dr. Lalit Mathur has reviewed for many journals and is currently on the editorial board of few journals. 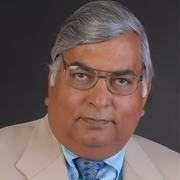 Dr. Lalit Mathur has over 11 peer reviewed publications. Dr. Lalit Mathur research interests include Medicine, Dentistry, Periodontics, Implantology, Dental Surgery, Restorative Dentistry and Endodontics.